Today we met at SCVWS President Karen Wong's house in Los Altos. 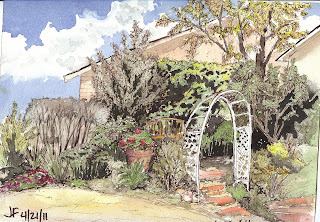 She has a lovely garden, as do several of her neighbors, and we all enjoyed painting there. Everyone LOVED her 10 week old puppy, Bones! Once again I used an Arches 140 lb. block, 9" X 12" and drew with sepia pens before I applied my washes. I went back afterward and added lots more pen. Next time I'm going to try to zero in on a smaller area so I can get more detail. The arbor is not skewed so wildly in reality-I just had drawing issues. Afterward I went to lunch with Kaaren and her mother, Kay Marinaro. 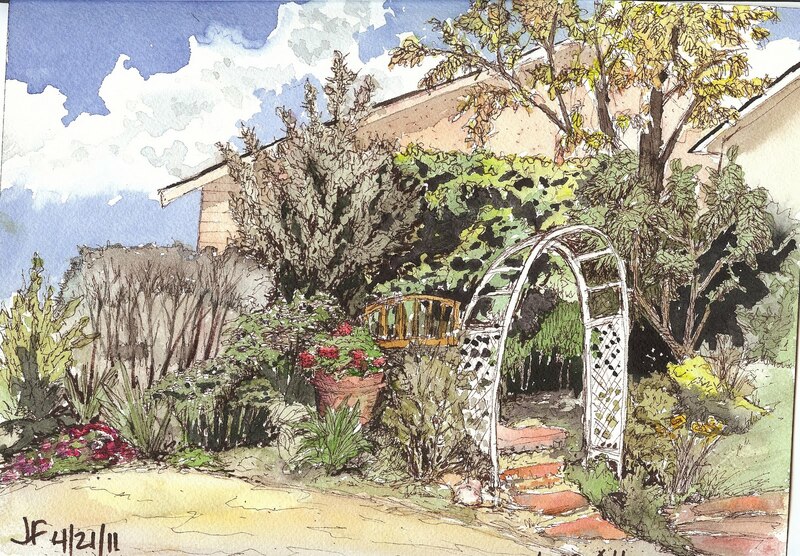 Kay isn't a plein air girl, but we're trying to get her to give it a try! We had a great visit.